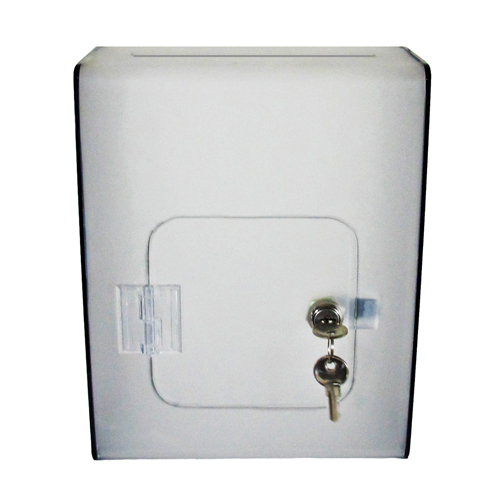 Six-sided, acrylic cubes with a slot in the top and a hinged, lockable door in one side. Available in a choice of standard sizes and colours, or we will make bespoke sizes and shapes to order. Use as they are, or ask for holes or keyholes to wall mount them. PLEASE USE THE DROP-DOWN BOXES ABOVE to view different options for this item (eg by altering the 'cube size'). Suggestion cubes are a modified version of our standard cubes, so they come in the same standard sizes. We can actually make them ANY SIZE YOU WISH. The sides don't all need to be all the same length! Use them as suggesion boxes, ballot boxes or posting boxes. Use them just as they are - free-standing on a counter or table top, or ask us to add keyholes so that they can be mounted on the wall. 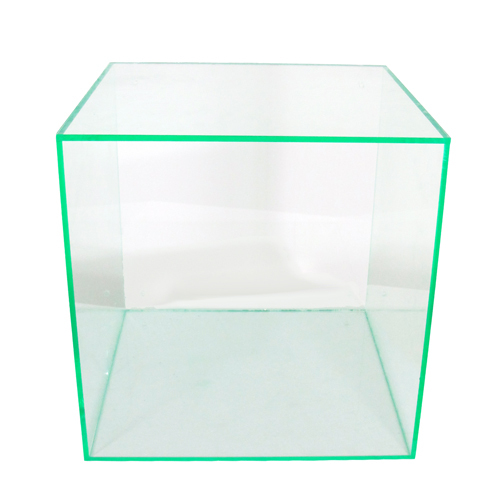 We fabricate suggestion cubes in sizes up to 300mm in 3mm acrylic, and larger ones we make from 5mm acrylic. Ask if you require anything else. Standard colours for acrylic cubes can be chosen here, but we can manufacture boxes in many other colours and finishes of acrylic. JUST ASK to find out what materials we have in stock. Doors and slots are a different size for each size of cube, but we can customise them to be any size you like. Doors are lockable, and two keys are provided. 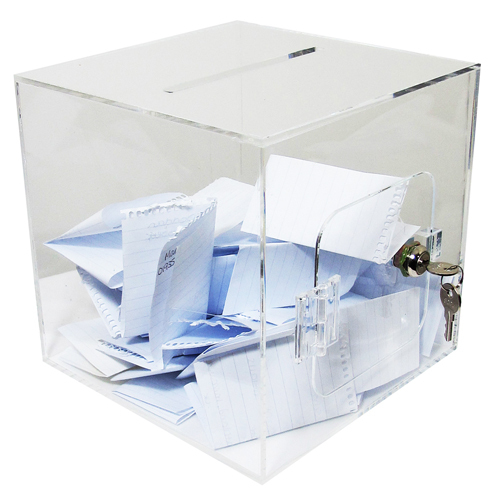 JUST ASK for a quotation for a bespoke acrylic suggestion box. We do acrylic fabrication on our premises in Hampshire, which is where we manufacture these acrylic suggestion cubes and many other items. Doors and slots are different sizes for each size of cube, but we can customise them to be any size you like.